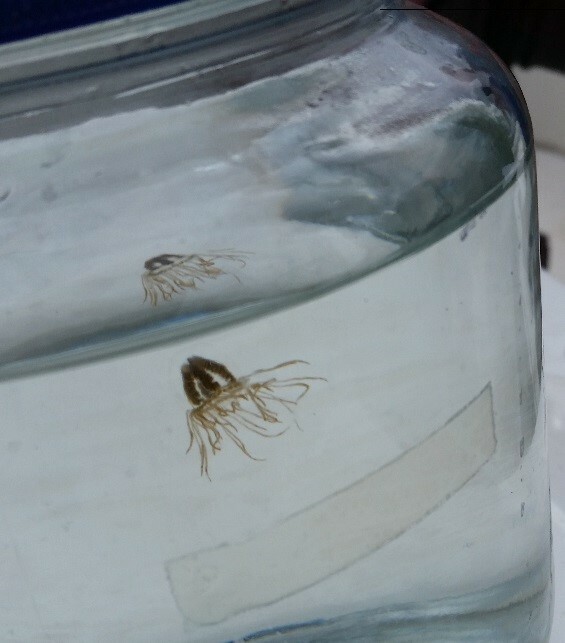 (18/P045) TRENTON – The Department of Environmental Protection is reminding recreational users of the Shrewsbury River to be aware of the possible presence of clinging jellyfish, a small non-native species that appears to be limited to a small population in this Monmouth County waterway. Clinging jellyfish were first confirmed in New Jersey in 2016. This week Montclair University researchers reported finding about 40 clinging jellyfish of between 1 to 2 centimeters in diameter and some about the size of a dime in an area off Monmouth Beach known as the Hook. The small jellyfish may indicate the start of a bloom. The clinging jellyfish is not known to inhabit ocean beaches or other sandy areas but tends to attach itself to submerged aquatic vegetation and algae in back bays and estuaries, areas not heavily used for swimming. The DEP and Montclair have teamed up to better understand the distribution of this species and to date have not confirmed its presence outside of the Shrewsbury River, except for one specimen collected from Monmouth County’s Manasquan River in 2016. The clinging jellyfish, a native to the Pacific Ocean, is very difficult to spot in the water. A sting can produce severe pain and other localized symptoms and, in some cases, result in hospitalization. It is not known how the species found its way into the Shrewsbury River but the polyp phase of its life cycle persists from season to season. The DEP encourages the public to exercise common sense and caution during recreation in areas where the jellyfish have been discovered. Anyone wading through these areas, especially near aquatic vegetation, should take precautions, such as wearing boots or waders to protect themselves. Swimming near lifeguarded beaches is, as always, encouraged. The clinging jellyfish has a red, orange or violet cross across its middle. Each jellyfish can trail 60 to 90 tentacles that uncoil like sharp threads and emit painful neurotoxins. Clinging jellyfish primarily feed on zooplankton. The jellyfish can grow to about the size of the quarter but is often around the size of a dime. Both the adult, or medusa, and polyp stages of the clinging jellyfish are capable of stinging, a mechanism they use to stun prey and to defend against predators.